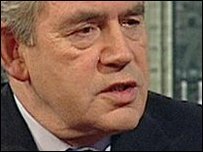 On Sunday 3 January Andrew Marr interviewed Prime Minister Gordon Brown. The unexpected at all times, and I'm sure that applies to politics as well as it does to Shakespeare. Prime Minister, thank you very much indeed for coming in. A Happy New Year to you. Could I start by asking about the airport security story which has dominated such a lot of the news recently. Are you in a position yet to fill us in in any detail about the kind of things that we're going to be seeing in our airports? Are we going to see these kind of somewhat intrusive body scanners and so forth? Yeah, this is a new threat, a new type of threat, and it's from a new source which is obviously Yemen, but there are many other potential sources like Somalia as well as Afghanistan and Pakistan. First of all, in airports people will see gradually being brought in the use of full body scanners. They will see checks for explosive traces. That will be done on hand luggage. Transit passengers will also be checked, as well as transfer passengers. And we will do everything in our power to tighten up on the security that is essential. We've recognised that there are new forms of weapon that are being used by al-Qaeda, so we've got to respond accordingly. Is this simply going to mean endless delays for people at airports? Already it takes a very long time to get through an airport. I hope not, I hope not. I hope we'll find a way of doing this in a more sophisticated way. It will be introduced gradually. The scanners are already being ordered by British Airports Authority. We've acted very quickly. I think we've got to also get back to the source of this, and that is Yemen, Somalia, Pakistan, and we've got to recognise that we've got a group of young people who have been radicalised as a result of teaching by extreme clerics and we've got to recognise that we're fighting a battle for hearts and minds here as much as everything else. We will work with the American authorities - as General Petraeus is in Yemen at the moment - we will work with them to improve the counter terrorism of the Yemeni authorities. You're working in what Michael Portillo I think rightly described as "a failing state" and, therefore, we've got to be very careful who we're supporting and what we're giving them support to do. But there is absolutely no doubt that the conference we'll have in London in January with a Yemen element to it will be an important means by which we will help the Yemeni authorities who are fighting terrorism develop the means and the will to do this even more. Since you mention Yemen, there's been some confusion this morning, Prime Minister, about a statement that came out of Downing Street yesterday saying that you and President Obama had had talks resulting in this new British American cooperation in Yemen. In fact the word from Washington seems to be that it was just at official level and that it's an American operation to which we are now contributing. Can you clear this up? Actually the truth is we've been doing this for some time. But had you had talks with President Obama about this? We've been doing this for some time and we've been working with the Americans to strengthen counter-terrorism cooperation in Yemen. Yemen has been recognised, like Somalia, to be one of the areas where we've got to not only keep an eye on, but we've got to do more. So it's strengthening counter-terrorism cooperation; it's working harder on the intelligence efforts. And of course it's this same thing that I'm talking about, which is I think going to become a feature of this decade - how we can prevent the perversion of a good religion Islam by a group of people who will stop at nothing in a murderous ideology that tries to create a caliphate, tries to create the sense that everybody is an enemy except those people who believe in a particular version of Islam. So we've got to work hard. So this is a new British initiative, this particular thing? of what we're doing, but a strengthening of what we're doing. I mean General Petraeus is in Yemen, so that we can strengthen what we're doing. And, look, it's really important, the announcement of our Yemen conference on 28th side by side with the Afghan conference, what we will do in Somalia in future weeks as well. It's a recognition that this is not simply confined to Afghanistan and Pakistan, although that is the epicentre of it. It's a recognition, as I found out from the first day I was in Downing Street when we had bombings or attempted bombings in London and in Glasgow, you can never be anything other than vigilant at every point in dealing with this global terrorist threat. But isn't there a problem here that when it comes to somewhere like Somalia and Yemen, the higher the profile of Britain and America getting involved in the struggle there, the more radicalisation goes on; and you know in a sense you're prodding such a sensitive part of the world, you could get a worse response? Well if I may finish, I'll say this. We've got to expose the extremists, we've got to encourage the radicals and reformers, and we've got to - like the Cold War in the 1950s - we've got to use every method, every method of communication possible because there are at least 5,000 Internet sites promoting Jihadist violence. It's just that your critics would say that by you know putting out press releases and stuff, that's the wrong approach, you could make things worse. Better to do it quietly, under the radar. I don't think it's about press release; it's about action. Since last week, we've taken action on airport security, we've taken action on explosive tracking, we've taken action on dealing with the location of people in Yemen, trying to find out what actually happened in Yemen, and at the same time we're strengthening our counter-terrorism activity. We haven't been doing nothing for the last two years. In fact, we have been preparing for events such as this. What we recognise now, of course, is that the radicalisation of young people in different parts of the world poses a problem to the whole of the world and we've got to do more. Before we leave the airport question, what about better profiling because one of the criticisms often made of people standing in these queues is that everybody is treated exactly the same way and that perhaps some form of political correctness or other stops the authorities from focusing on those people that they are more suspicious of? I don't think that's the case, Andrew. We have got a watch list, we are identifying people who are coming in. There are many people who've been refused admission into the country because they're not acceptable to us and we're checking people all the time against that watch list. You get young mothers with toddlers being sort of strip searched and so on. Yes, but I think you've got to understand that where there's a watch list, there are particular people who are being targeted, and if they turn up at an airport they will get treatment way beyond what is dealt with with other people. And these scanners that you're ordering, are you convinced they work because there's been some suggestions they don't? I talked to Andrew Adonis this morning about it. You can't be convinced of the absolute proof of the working at a 100% level of any technology. That's absolutely true. But this will be better than what we've got. It will be dealing with a problem that people have identified. We've found that there is a new form of explosive that was not being detected by ordinary machines. We've got to go further. Our first duty is to the security of the people of this country. Over the Christmas holidays, I think we've been very active in making sure that the lesson we have learned from America is being applied in Britain, as it will be applied in other countries. As I say, it's not just airport security. It's identifying the problem in Yemen itself and it's also identifying what I think is a bigger problem, as I said - the radicalisation of young people throughout the world and how effectively democracies can counter that by not just broadcasts but by supporting the reformed clerics who actually want to present a version of Islam that is not the perversion of it that we're seeing today. You mentioned clerics. Can I ask about Iran because there have been stories that the British hostage who was freed, who came back to this country, had been in Iran; had actually been taken over the border and kept there. Can you shed any light on that? and other one who we still don't have information about. And how do you regard Iran at the moment? Is this a country on the edge of a revolution, do you think? in Iran in the next few months. I think our policy is still this: to appeal to the Iranians to become part of the world community; to accept that that will involve responsibilities but to recognise that the cost of not becoming part of the world community and rejecting all the advances that have been made by America and others is a period of isolation. Now I hope even now that there are sensible voices within the regime itself, as well as within the demonstrators, that recognise that a period of isolation from the rest of the world will do Iran, which is a very cultured country and a country that has got enormous economic potential, will do Iran no good whatsoever. So I think it's a choice that has got to be made by the Iranian government, but I think we're seeing the way the Iranian people are starting to think. you know you control one area, al-Qaeda and their operatives simply move to another failed state and it's an endless chase around different parts of the world? Yes, but one way of looking at this is that the weakness of al-Qaeda in Pakistan has forced people out of Pakistan and forced them into Yemen and Somalia. One lesson I think we've learned is that by taking on al-Qaeda in South Waziristan, we have diminished their strength, we have dispersed their organisation, their training camps are far more limited. Therefore their impact on Afghanistan is that much less and likely to be that much less in the future. Of course that means that other centres will appear, but they will not have the strength that al-Qaeda had in Afghanistan and in Pakistan itself. So our strategy is in one sense working, but it means we've got to be vigilant in every part of the world where there is a failed state or a failing state, which creates space for a terrorist group to operate. Let's turn to domestic politics, if we may Prime Minister. On that same subject, David Cameron's suggestion that if he won power, he would bring opposition leaders into a war cabinet would strike many people as a very sensible one. Well we do consult the opposition leaders. They get briefings on privy council terms. But if I may say from my experience of government what a war cabinet is like. We have the Head of the Defence Staff on it, we have the Head of MI5, the Head of MI6, we have the Head of GCHQ. We have a whole range of people who are not serving politicians but actually people who are in a position of authority. (over) Quite useful to have opposition leaders in there. Well I would have thought that the best way of dealing with opposition leaders is actually briefing them on privy council terms because some of these decisions are contentious. We haven't had the wholehearted support from the opposition in a number of things that we've done - both in relation to Afghanistan and in relation to other ventures. I think governments must govern, but at the same time the war cabinet that we have, which is called ENSID, works very well by having - as I think a lot of people don't know - of having the Chief of the Defence Staff, and all the major players from the security services are actually members sitting in on these meetings while we make decisions. And we're meeting this week to discuss Yemen and Somalia as well as other things, so the idea that there is no effective war cabinet - it meets about every week. And you'd rather not have David Cameron sitting round the table at that moment? Well I'm happy to brief all opposition parties about what's happening, but of course there must be scope for the opposition to disagree. Okay. A lot of coverage again today of the state of the economy. Before we get into the sort of figures - if we do - can I ask a general question, which is given what's happened to the city and given the shrinking of our manufacturing base - really quite dramatically over the last ten years - how are we going to earn our living as a country over the next ten years? (over) So which bits of the economy are going to grow? (over) We can't earn our living through fashion, Prime Minister. Hold on, hold on. I've just been talking about pharmaceuticals, biotechnology, advanced engineering. I'm talking about the whole range of modern industries. We have got a platform in Britain, if you'll allow me to finish, for building for the future. What does it depend on? Investment by the government. And that is the choice: will you be prepared to invest for the future in these industries? Skills. We need the highest skills for the future and we need to be seen as a creative hub of the world where all the talent of the world are able to descend upon us. Now my vision for the future of Britain is as the digital, low carbon, biotechnology, education, creative industry leader of the world. And that's where the jobs will come from, I tell you. I could say that over the next few years a million jobs will come from the expansion of these areas as a result of the effort that we are making now to build a strong industrial strategy and a strong education policy. I remember you very well during the Thatcher years as an opposition politician ferociously attacking the then government for de-industrialisation, and yet our manufacturing industries have shrunk much faster in the last ten years under New Labour than they did under Margaret Thatcher. Can I just stop you on that actually? Electric cars are being, you know that's being dominated by Japan and the United States. We're getting our wind farms from Germany, we're getting our nuclear power stations from France. (over) Hardly British names, Prime Minister. (over) But their profits go home. (over) There's no money left to invest, Prime Minister. You have a huge, huge deficit to deal with and you have not yet told the country - granted the other parties haven't either - how you're going to plug that gap. Well can I ask you about departmental budgets? Hold on, hold on Andrew. Have you read our deficit reduction plan? Our deficit reduction plan was the first in the world. It is halving the deficit over four years. (over) But it shunts it all off. (over) It doesn't tell us about the hard decisions being taken now. (over) No, we're raising your taxes to do it. You will have to pay more in the top rate of tax to do it. The pension tax reliefs that were very generous in the past have had to be removed. We're raising national insurance by 1% to protect our public services so that we can still spend more on health and more on education and more on policing. And we are taking the difficult decisions that the Conservatives refuse to take, to halve the deficit over the next four years. Now if you want to halve the deficit by more and more quickly, then you will inevitably hold this country in recession for far longer. But if you want to take the moderate course that we are taking, which is the reasonable course - having dealt with a huge financial crisis that wasn't caused by us, but a financial crisis we had to deal with - we are now taking the action that is necessary. And so we have a deficit reduction plan that certainly means public expenditure will only grow by 0.8% in real terms each year, but also means that we have said to people look, if you want the decent public services that we've got and you want to see the personalisation of education like free tuition or cancer care, like free cancer care, then we will have to take these decisions. So it's a balance between efficiencies, borrowing, the tax changes we're making, and economies in public expenditure. Now that's the right policy for the future. I understand the argument. What I have a problem with is the figures because the figures that have been announced so far go nowhere near meeting what you have stated to be your aim, which is a halving of the deficit - 178 billion over four years. The IFS, a pretty respected organisation, says that if you are going to protect frontline services in health and education, that means about a fifth of the budget, real terms budget of other departments is going to have to disappear over three years. Hold on. We've announced it. No. We've announced the tax rises. (over) And no further tax rises coming? (over) It's going to go up to, what, 2.7/8, 2.8, something like that? Not as high as that? If I were to give you a figure today, then we are assuming that we will be spending five billion more on unemployment as a result of the way that the calculations are made, and we are unlikely to have to do that. And the reason is, let's be honest Andrew, we have taken action that you know has avoided the serious unemployment problems that we've had in previous recessions. (over) We have taken action that has avoided the repossessions that we've had in previous recessions. And lots of small businesses are in business as a result of the action that we've taken. Now there should be some acknowledgement of that. Sure. But you're not seriously suggesting that you can halve the deficit on the basis of the tax rises that you have already announced? It must mean dramatic and pretty draconian cuts in public sector budgets outside the ones that you're going to protect? What I'm saying to you is that you haven't told us what that means. What we have said is we will raise public expenditure by 0.8% per annum after 2011. What we are going to continue to do is raise public expenditure this year because we believe the recovery is not assured. And when things are more certain, we'll be in a better position to tell people what the right outcome on the other public services is likely to be. But I tell you, we have managed to do what nobody thought was possible a year ago, and that is to keep unemployment down, to keep lots more businesses in being. In fact, more businesses started last year than in the previous year. (over) They will get their chance next week. (over) If I could stick with the Labour party at the moment. (over) Well they made the wrong judgement on everything. We got it right and we are the only party that can take people from recession to recovery and guarantee that we have growth in the future, and I'm very confident about the basis of growth in this country. That's why I talked this morning about an age of aspiration for Britain and not what the Conservatives talk about, which is an age of austerity. can you get through a budget on this basis? the question is whether are you confident about the British economy in the future because of the assets and the potential that we have? And I am confident. This is a defining issue of the election. I believe in an age of aspiration, of opportunity and prosperity. I'm afraid the Conservatives have gone for an age of austerity and that means that the majority of hardworking families suffer as a result. If you're confident, is there going to be a Labour budget this spring? Of course there'll be a Labour budget if it's the right time, yes. is that a yes to a budget this spring? I believe there'll be a budget this spring. It's the right thing to do. So we can't look forward to an early General Election? I'm not going to be boxed in, as I said. I said there'll be a Labour budget if it's at the right time. that grows, or do you want to direct the recovery? Now these are the sort of questions. But that's what people are asking. So you're going to have this election campaign where the country's going to decide. Who's going to be chairing your daily press conferences? Is it going to be Harriet Harman or is it going to be Lord Mandelson? We've spent 25 minutes talking about serious stuff, Prime Minister. We need a little bit of fun at the end. I'm just wondering whether Peter Mandelson or Harriet Harman's going to run your election campaign. (laughs) They're both going to be playing very big roles in the election campaign and every part of this Labour cabinet is a team. It works well and it's a team that will be actually fighting an election on the basis of the big issues. I think the Conservatives you know wanted an election that was essentially a referendum on Labour, and then I think they thought they would get an election on the small issues. This is an election about the big issues and it includes whether we're isolated as a country or cooperate internationally with Europe. It includes whether we're going to have decent frontline services for the future, like social care for the elderly, or whether we're just going to have blanket public spending cuts. I have managed this country through good times and difficult economic times and we can manage this country through the next stage, which is moving from recession to growth, to high levels of growth and high levels of employment, giving people new jobs. ', there's then a little bit of a gap and a bit of a problem. Because he knows how to deal with the British economy's problems and take us through them, and he knows what sort of economy we can build for the future that will give young people in our country the jobs that they need. And he's got a passionate desire to improve our public services and his whole career has been built on wanting to see everybody realise their potential to the full. It's not a difficult question to answer. And, equally, and equally you know elections are about choices and they're about the choice between whether you want to move forward or keep putting the recovery at risk. Because there's no doubt in my mind the Conservative policy has put the recovery at risk. bring a rebel party he's had. Have you seen these people off? and about the policy that I believe is the right policy for dealing with global terrorism. We could have talked about climate change and the issues that I am still raising about how we can get an international agreement on climate change. We're talking about global growth, so that we can have British growth and British jobs and a British future that is the best for the people of Britain. And to be honest, to talk about internal disputes or comments - and I think they're just comments in the Labour party - is not really where we want to be, or I think where the people want it to be. Do you regard yourself going into this election year as the underdog? I think when you're behind in the polls, you've got to regard yourselves as the fighter. And I've always fought. Everything I've ever won in my life, I've had to fight for. Everything I've ever won, people have doubted whether it could be possible. I actually believe that when the British people see the issues at stake in this election and when it ceases to be the referendum that the coverage of politics has made over the last two years, whether it's about expenses or whether it's about the economy, people will see they've got a choice to make. And the choice is between someone who is ready to fight for every aspect of Britain's future and will not stop fighting, and I think that's where people will want to see the issues. I was obviously always happy to have a debate. I mean it's a different one between having a debate with you, because you're sometimes seen as faster on your feet than me as well, I think. Nonsense, nonsense. (Brown laughs) Can I turn to another big area, which you mentioned yourself, which is Copenhagen, briefly, because that has been seen - and no doubt you worked very hard - as a failure. Are we now in a period where we're going to go through a long process of the world community trying to kind of struggle up again and put together a new sort of trajectory for yet another deal or what? This is a test. This is a test of whether the world can work together. We passed the test at the G20 when we had it in London in April. We didn't quite pass the test in Copenhagen because we couldn't get an agreement on a long-term treaty - in other words everybody feeling bound in to a common strategy that would last for ten years. I've got an idea about how we can actually move this forward over the next few months and I'll be working on this, and I think it's not impossible that the groundwork that was done at Copenhagen could lead to what you might call a global agreement that everybody is happy to stand by. Now I'll be working on that in the next few months and I can see a way forward because what prevented an agreement was suspicion and fear and forms of protectionism that I think we've got to get over. So all is not lost. You mentioned earlier on, you mentioned Andrew Adonis. He says this morning in the papers that he is on the same ideological page as Nick Clegg and that he can see a progressive coalition being formed between Labour and the Liberal Democrats and he says he thinks that "Gordon Brown is in the same place." Well where there's an agreement on ideas - and of course the Liberals I think are closer to us on tax and public services - there's obviously the possibility of people working in common harmony. But equally we've got party politics that come in the way. (over) So you can see a bit of harmony with the Liberal Democrats? And equally at the same time we've got policies on the environment and we've got policies on civil liberties that are not dissimilar from them. But as for the fighting of the election, we, the Labour party, will fight every inch of the way. We've known what it is to lose and we've known what it is to win, and we are determined to fight our way to win. And not for our interests, but for the interests of the country. (Brown laughs) No are you worried about the number of old Etonians in public life? Do you think that they should be treated differently because of where they went to school? So it's only a joke. Not to be taken seriously. And you're not going to attack Cameron for being a toff? (over) So you'll lay off education background as far as your ministers are concerned? Look, look, if you think the playing fields of Eton was anything other than a joke, then I think you take your politics too seriously. Nobody's ever accused me of that before. Prime Minister, for now thank you very much indeed.